Or rather it is exceedingly simple. 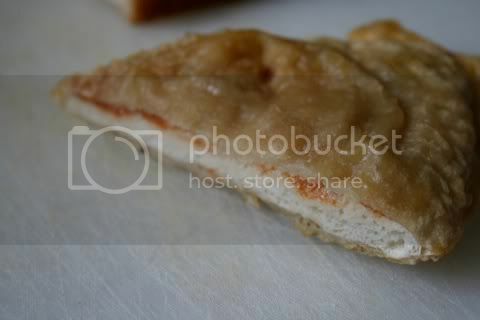 There are in fact two different types of deep-fried pizza; the “pizza” and the “pizza crunch”. 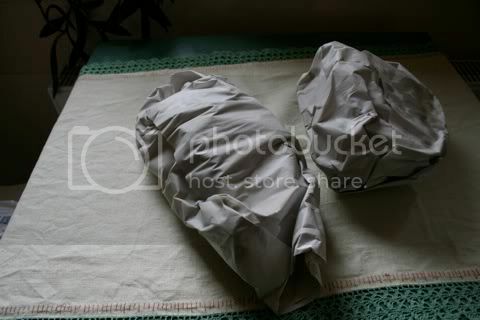 One is battered – the crunch – and one is not. 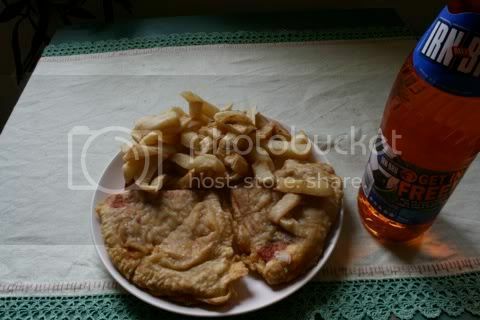 In the interests of science, both are displayed here a “1/2 Fried Pizza Supper” and a “1/2 Fried Pizza Crunch Supper”. 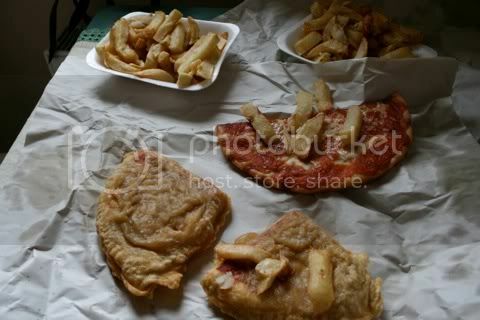 As with all Scottish chip shops, the “supper” means with chips. Aside for the British colonies. What the world calls chips we call crisps. What the world calls fries we call, fries. Contrary to the simplistic explanations you may have heard, UK chips are not the same as the worlds fries (or rather, the Belgians’ fries) but they are in fact much larger and less crispy. As scholars write theses on the difference, here’s a wikipedia link so I don’t have to try. 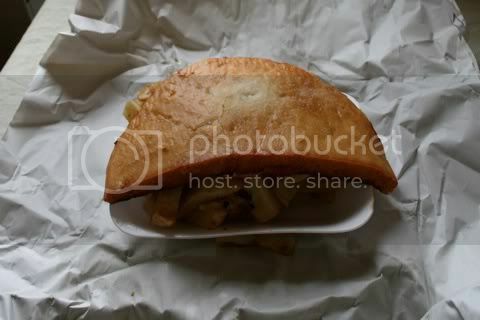 The pizza crunch was served in battered quarters whereas the plain pizza was merely halved and flopped top-down on chips. 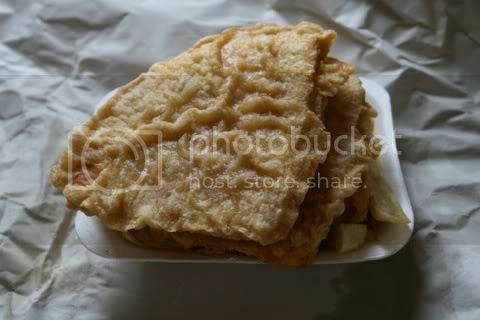 A word on the quality of the pizzas: the chippy we bought these from is renowned for its hand-made pizzas. These are not their fine produced hand-made pizzas. These pizzas are the cheap frozen kind from the cash and carry. Much like you don’t get the finest cut of beef in a fancy restaurant if you order it well-done, you don’t get the hand-crafted goodness when it’s destined for the fryer. If you look closely at the edges of the deep-fried pizza (as opposed to the battered one) you can see it’s been well fried and is crisp and full of tasty oil. Note the tasty chips cheese-glued to the top. 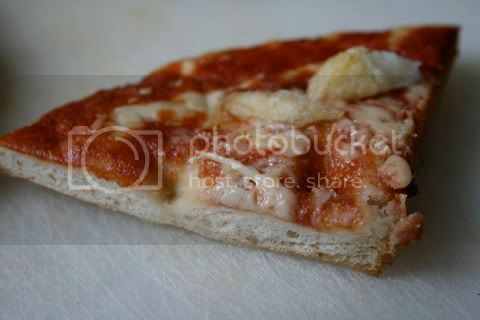 As you can see in the battered crunch, the pizza itself is remarkably ungreasy. 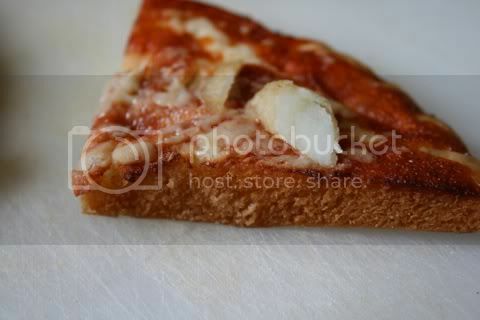 Yes, the shocking truth is that the battered pizza contains less oil than the unbattered one. Both kinds taste excellent. They may not be hand made and cooked in a wood-fired stone oven, but if you want that, there are plenty of quaint and pretentious little restaurants around. Knock yourself out. These are full-fat ned food for the guy in the track suit that would only run if the ‘polis’ were on his tail. Let’s be honest, they’re cheap pizzas elevated to greatness by being deep-fried. Marvelous. In Scotland, to eat either of these without a glass bottle of Irn-Bru to wash it down would be heresy. These delicacies were bought at Cafe Q in Strathaven, South Lanarkshire. The prices are visible in the photo above. 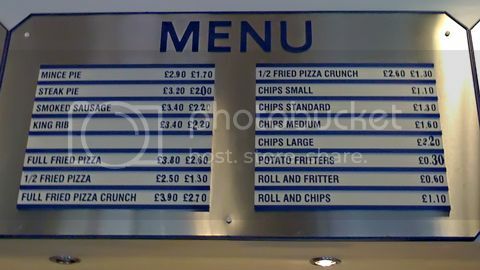 £2.50 for the fried pizza with chips and £2.60 for the pizza crunch supper. That’s about $5 a meal. Its the cat alarm clock! OMG, I want a pizza the action. They actually sound and look quite exciting. Maybe a dessert of battered ice cream to go with it?